Normally, I'd give the classic remake of the sci-fi classic its own post, but John Lewinski did a good job of covering the bases when he spoke to David Tennant at SDCC. Tennant's in his last series as the Doctor, as we all know; his final episode will be 75 minutes (probably expanded to 90 minutes or 2 hours here to account for commercials) and air around Christmas. According to BBCA chief Garth Ancier, they've gotten better at airing shows soon after they bow in the UK, and the last Tennant show will be no exception. As far as the overjoyed reception the show got at SDCC, Tennant had a great line: "I wanted to crowd dive but they were all sitting down. It was disappointing." At the TCA event held today, BBC America’s DOCTOR WHO cast and crew were on hand to discuss the future of the show, the last few episodes and more. David, Julie Gardner, Russell T Davies and Euros Lyn took to the BBC America stage at TCA Summer Press Tour in Pasadena, California, yesterday. More photos from the panel can be seen here. Planet Of The Dead is now available to buy on DVD in the USA. It is also released on HD Blu-ray. You can purchase the standard and Blu-ray DVDs for from as little as $9.99 via our US shop here. Lots of new Comic-Con photos have been added to the image archive thanks to Anna Altheide. 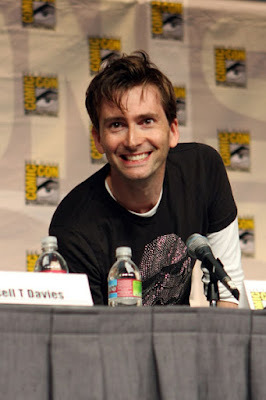 This year at San Diego’s Comic-Con, fans of the BBC’s flagship Sci-Fi show, Doctor Who, were treated for the first time to an appearance by The Doctor himself, David Tennant. Before their panel appearance, David Tennant and producer Julie Gardner (who has also just concluded her time working on Doctor Who) met with the press to discuss the final specials and to tantalize fans with a few glimpses of the specials. Both also showed a fondness for each other, both professionally and personally, that set a refreshingly friendly, fun tone to the interview. Discover has an audio interview with David and Julie Gardner for you to download here. There is also an audio interview with Russell T Davies and Euros Lyn here. Guinness World Records has named Doctor Who the most successful science-fiction series. 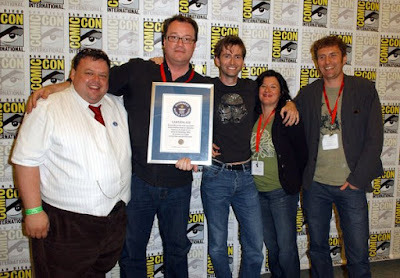 It is the second Guinness record that the show now holds, it also holds the record for longest running Sci Fi series. The new honour was based on a combination of ratings and DVD and book sales. "It is too good a show to have just one record," Guinness editor-in-chief Craig Glenday said after handing over the award at the Comic-Con on Sunday to the Doctor Who panel. IGN: David, have you processed that you're not going to go back and get in the suit again ever, or at least for a long while? Tennant: It don't really know. It's funny, when we finished there was a chance that I was, wasn't there? We were going to go a little extra thing which has unfortunately fallen through. So I always had that. And now that's not happening. But I don't know. Not necessarily an articulate answer, is it? Gardner: Where is the suit? Tennant: Well, a version of the suit is hanging up in my wardrobe at home. IGN: Did you keep it? Tennant: I got sent it. I don't know if I'm even allowed to admit that. That probably breeches some sort of BBC policy guideline. I'll probably have to be hauled across some bureaucratic coal for that. Lyn: And in the two-parter, we did trash more than one of the suits. More new photos of David at Comic-Con have been added here. And while we're at it, check out cknepher's amazing Comic-Con pics here. "The Internet is a curious place, isn't it?" 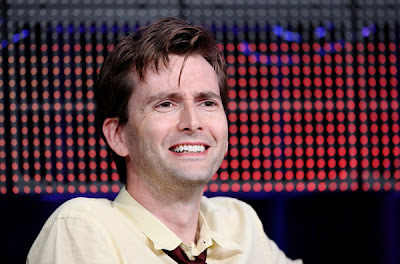 Tennant told MTV News. "I think someone sits in their bedroom in Saskatchewan and comes up with an idea and they post it. And within minutes it's around the world and I'm getting phoned up by journalists and friends of mine saying, 'When are you off to shoot with Guillermo [del Toro]?'" said Tennant. "It's not something I know anything about." "No one's talked with me," he added. While Tennant's no stranger to special effects, he doubted even the most impressive computer's ability to bring him down to Hobbit size. "I'm a bit tall, aren't I?" he joked. "I know they do things with CGI now, but I'm 6'1". Hobbits are little. I do have quite hairy toes, though." The video can only be viewed by fans in the USA. 9.57am: There appears to be eight mics up on stage today. As well as some preview clips of the final specials, we're also expected to get confirmation of a Doctor Who movie today.9.58am: At this point I am probably allowed to share the insider info I got on this movie a couple weeks back. Apparently, the film will feature Rose and The Other Doctor, set in the parallel world. It's July, but it already feels like Christmas is right around the corner. And instead of getting the fun holiday story that we're used to, we're instead going to get a great two-parter that will not only mark the end of David Tennant's run on the show, but the beginning of a new era with Matt Smith in the iconic role and Steven Moffat as the showrunner. While there might be a little trepidation to accepting a new actor in the role, Tennant says Smith deserves a fair shake in the role. "You'll watch the finale and then in a few weeks, you'll think that Matt Smith is the best that's ever been," Tennant told attendees at a panel at San Diego Comic-Con. "Change is part of the show. I'm very proud to be a part of history, but I'm also proud that we're handing it over in good health and that it carries on." Have added more pics from the San Diego trip to the Image archive here. Including this fab one of David and Russell with Jonathan Ross's lovely kids..
Our friends over a www.bitchbuzz.com have an exclusive interview with Jonathan Ross which is well worth a look! Check it out here. But! We do have some fabulous news from the Doctor Who Comic-Con panel. Another Comic-con interview with David.. This time with John Scott Lewinski of The TV Squad. 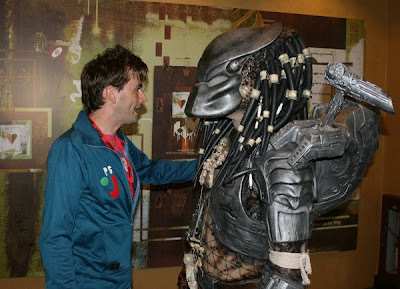 It's safe to say David Tennant wasn't prepared for what he was running into at Comic-Con International. "I've never been to San Diego before, lets alone Comic-Con," Tennant told me in the Scottish accent he hid while playing The Doctor for five years on the BBC's crown jewel, Doctor Who. "The fan response here has been incredible -- just walking to the elevator. I can't imagine what'll be like during the panel (Sunday)." 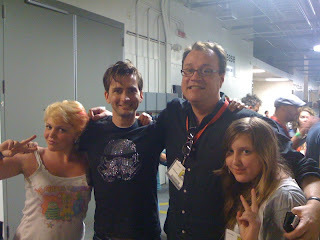 Tennant is attending Comic-Con with former Who show-runner and Torchwood creator Russell T. Davies to promote the final specials featuring Tennant in the lead role. And, with mere hours to go before Sunday morning's Doctor Who panel (one of the major events of Comic-Con's closing day), he insists that's the only reason he's there -- besides meeting the fans. David was at Comic-Con yesterday to introduce a special screening of Planet Of The Dead.. and managed to get a kiss with John Barrowman too! Jonathan Ross has uploaded the above photo of David and his friend Tommy Lee Edwards at Comic-Con to his Twitter account here. More photos of David at Comic-Con will be uploaded to our Image Archive here. There are a couple of journalists on Twitter asking fans to submit questions for the Doctor Who panel tomorrow. 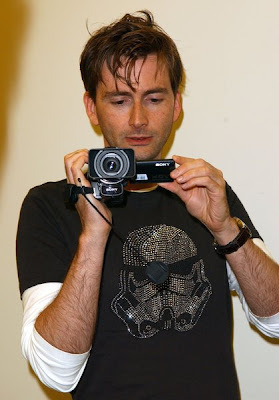 If you have any more photos of David at Comic-Con that you would like to share then email us here. In support of BBC AMERICA’s U.S. premiere of four Doctor Who Specials, the Doctor himself, David Tennant, is appearing alongside writer/executive producer Russell T Davies at this year’s Comic-Con in San Diego. They will take part in a Doctor Who panel along with executive producer Julie Gardner and director Euros Lyn, Sunday July 26, 10:00-11:00am PT. David has travelled to Comic-Con, fresh from the Doctor Who set, having shot his final scenes as the tenth Time Lord. He and fellow panelists will discuss the latest incarnation of television’s longest running science fiction series and take questions from the floor. There will also be exclusive sneak peeks from the upcoming specials. Fans can visit the BBC AMERICA booth (#3629) to capture their own photograph alongside part of the Doctor Who set - as well as purchase exclusive merchandise including David Tennant figures. Planet Of The Dead makes it premiere in Canada tonight at 21:00pm on SPACE. Visit SPACE's Doctor Who site here. 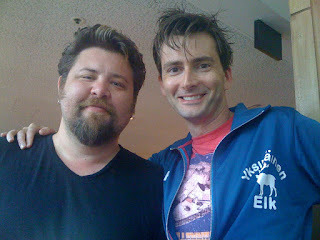 The next exclusive to audio, Doctor Who adventure, The Day Of The Troll, will be narrated by David. The CD is released on 8th October 2009 and can be pre ordered from the shop here. In a special event to mark Homecoming 2009 and the 10th anniversary of Our Dynamic Earth, the leading Edinburgh visitor attraction is opening its doors to the public for free this weekend, 25-26 July. Open Doors weekend, which takes place at the same time as The Gathering in neighbouring Holyrood Park, will enable visitors of all ages to delve inside a fascinating story of Planet Earth, with free access to galleries and exclusive performances. Intrepid explorers can plunder through a sticky rainforest, feel the earth move beneath their feet and touch a real iceberg within captivating and interactive displays. A climax to the journey will be We Are Astronomers, the new full dome projection film which immerses the audience in the stars as they travel through far off galaxies, narrated by David Tennant. As you may know the RSC held it's Open Day last weekend and a number of members of our forum were lucky enough to go along and join in the action. Among the exhibits on display was one of David's costumes from Hamlet. Some visitors on the guided tour also got to see the dressing room at The Courtyard Theatre that David used whilst performing there last year. Doctor Who fans in Australia will have a second chance to see series 3, featuring David Tennant, when the 13 episodes screen on ABC2, starting Monday 24th August at 9.30pm. Each episode will be followed by Doctor Who: Confidential Cutdown, which takes viewers behind-the-scenes, to see the making of the episode. The BBC are releasing a new audio CD on 5th November 2009. Doctor Who At The BBC: A Legend Is Reborn is a fascinating volume of interviews and behind-the-scenes features from the world of Doctor Who, as first featured on BBC radio and television. Featuring the voices of David Tennant, Catherine Tate, Billie Piper, Christopher Eccleston, Kylie Minogue, Freema Agyeman, Russell T Davies, Julie Gardner, Phil Collinson and many others, this is a retrospective look at the return of Doctor Who to our screens in 2005, following the story up to 2008 and the impending departure of David Tennant as the Doctor. You can pre order Doctor Who At The BBC: A Legend Reborn in our shop here. 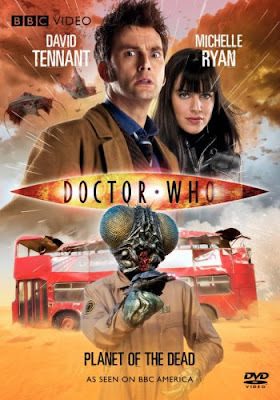 In London for the 2012 Olympic Games, Rose and The Doctor find children are disappearing, car engines are failing for no apparent reason and a lonely young girl has been taken over by a very lonely alien. Mark Gatiss examines some of the show's scariest moments, that have sent the nation scurrying behind the sofa. Featuring clips from both the classic series and the modern-day revival. Specially filmed as a companion piece to Doctor Who. Includes behind-the-scenes filming and interviews with the cast, writers and production team as they bring our favourite Time Lord back to our screens. A man is tormented by lack of sleep because of a recurring dream in which he is woken up in the middle of the night and made to drive 250 miles from London to Bradford to deliver a briefcase. Every morning he wakes up exhausted and fears he is going mad. Black comedy, starring Chris Langham and David Tennant. In the last programme of the series, Jeremy Clarkson, Richard Hammond and James May take the new BMW M3, Mercedes C63 AMG and Audi RS4 down to Spain for a thorough test of performance. David Tennant swaps the Tardis for the Reasonably Priced Car, James test-drives and new Jaguar XF and Richard wonders what happened to that ultimate symbol of Sixties grooviness - the beach buggy. As you may know David signed some more cards to raise money for Headway Essex recently. If you haven't already got one then make sure you get your hands on one as soon as possible. The prologue and chapters 1 & 2 are online already. The LA Times are inviting readers to submit questions for David and the rest of the Doctor Who panel to answer at this year's Comic-Con. Click here to find out full details. Glorious 39 will get it's premiere in September at the Toronto International Film Festival. The film is a period piece set in 1939, as war looms over Europe. David stars in the film as Hector. Following the success of "The Essential Shakespeare", the British Library and the Royal Shakespeare Company are proud to present a second audio set of live Shakespeare recordings, "Essential Shakespeare Encore". The two discs feature scenes and speeches taken from RSC productions in Stratford-upon- Avon and London, recorded by the British Library and the RSC over a period of almost half a century. As in the first volume, all the recordings are being published for the first time. The extracts, chosen by RSC Chief Associate Director Gregory Doran, are taken from productions that were not included previously, so as to complement the first volume. The roll-call of prestigious portrayals runs from Paul Robeson's legendary Othello in 1959 to David Tennant's highly-acclaimed Hamlet in 2008.